Croatia is known for its idyllic coastline. But within the interior is the lesser-known, captivating Plitvice Lakes region, the country’s first and most important national park. To visit Plitvice is to indulge in one of Europe’s best back-to-nature experiences. Imagine Niagara Falls diced and sprinkled over a heavily forested Grand Canyon. This lush valley of terraced lakes is laced together by waterfalls and miles of pleasant wooden-plank walks. Countless cascades and strangely clear and colorful water make the Plitvice Lakes National Park (Nacionalni Park Plitvicka Jezera) a misty natural wonderland. Plitvice deserves a day of your itinerary. Since it takes some time to get to the park (2.5 hours by bus from Zagreb, 4 hours from coastal Split), the most sensible plan is to spend the night in one of the park’s comfortable, inexpensive hotels. Ideally, arrive at the park in the evening and stay overnight. You can get an early start the next morning and hit the trails; by afternoon, you’ll be ready to move on (perhaps by bus to the coast or back to Zagreb). Two nights and a full day at Plitvice is probably overkill for all but the most avid hikers. 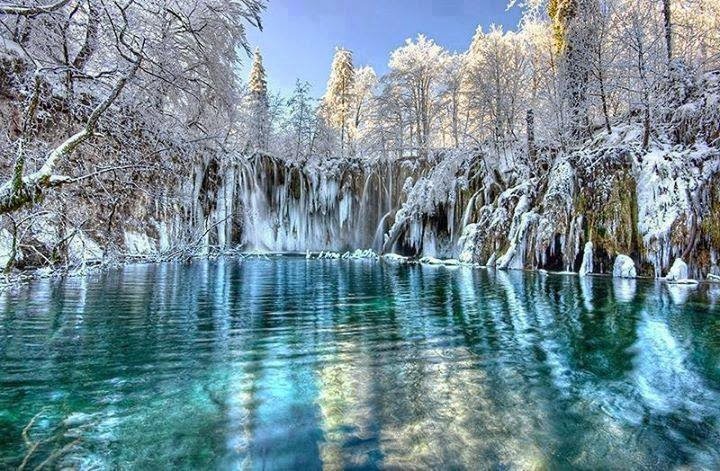 Plitvice became Croatia’s first national park in 1949. Thirty years later, it was added to UNESCO’s World Heritage list. On Easter Sunday in 1991, the first shots of Croatia’s war with Yugoslavia were fired right here—in fact, the war’s first casualty was a park police officer, Josip Jovic. The Serbs occupied Plitvice until 1995, and many of the Croatians you’ll meet here were evacuated and lived near the coastline as refugees. Today the war is a fading memory, and the park is again a popular tourist destination, with 700,000 visitors each year. In 2003, only 1.5 percent of the park’s visitors came from the U.S. Americans wary of visiting Croatia are missing out on a park that puts any manmade water-park to shame. Plitvice’s 16 lakes are divided into the Upper Lakes (gornja jezera) and the Lower Lakes (donja jezera). The park officially has two entrances, each with ticket windows and snack and gift shops. Put on your best walking shoes—Plitvice’s system of trails and boardwalks makes it easy for you to get close to the park’s beauty. I like hiking uphill, from the Lower to Upper Lakes—a path that offers slightly better head-on views of the best scenery. Near the beginning of the Lower Lakes trails, you’ll have the option to visit the Big Waterfall (Veliki Slap). It’s worth the 10-minute detour loop to see the biggest of Plitvice’s waterfalls, where the Plitvica River plunges 250 feet over a cliff into the valley below. Depending on recent rainfall, the force of the Big Waterfall varies from a light mist to a thundering deluge. Near the Big Waterfall, a smaller trail branches off toward Supljara Cave. This unassuming cavern is a surprisingly big draw. In the 1960s, several German and Italian spaghetti westerns were filmed at Plitvice and in other parts of Croatia (which, to European eyes, has terrain similar to the American West). The most famous, Der Schatz im Silbersee (The Treasure in Silver Lake), was filmed here at Plitvice, and the treasure was hidden in this cave. The movie is still a favorite in Germany—complete with Deutsch-speaking "Native Americans"—and this park is a natural stop on popular theme tours that bring German tourists to movie locations in Croatia. Look for wildlife as you hike. The park is home to deer, wolves, wildcats, wild boar, and more than 160 species of birds (from eagles to herons to owls). The lakes (and local menus) are full of trout. Visiting Plitvice isn’t like climbing Mount Everest—within the park you can count on WCs, picnic tables, and a pit-stop-perfect clearing with a souvenir shop and a self-service restaurant. From this spot, you can catch the shuttle boat across Lake Kozjak to the bottom of the Upper Lakes. While you’re waiting for the boat, visit the friendly old ladies in the kiosks selling wheels of cheese and different kinds of strudel. Catch the boat across Lake Kozjak, then hike to Lake Gradinsko. This is the prettiest part of the park. Plan to take your time—and be thankful you remembered to bring extra film. When you visit Plitvice, it's easy to be awed by the countless waterfalls. The ever-changing fluid landscape—created by water, gravity, limestone and time—is mesmerizing. The park plays you a bubbling lullaby...and offers you strudel for dessert. Years ago, after eight or nine visits, I thought I really knew Europe. Then I discovered Plitvice and I realized: You can never exhaust Europe’s surprises. A national park since 1949 and a World Heritage Site since 1979, Plitvice (prounounced pleet-wee-cheh) is still relatively new on the European tourist trail, but certainly not undiscovered. Set at the top of Croatia’s Adriatic region in a karsted area of the Dinaric Alps, just two hours from the capital city of Zagreb, the park is visited by over 1.2 million people each year. A sprawling limestone and dolomite chalk landscape of blue-green lakes, mossy caves, trickling streams and spectacular waterfalls, this geological wonder formed at the confluence of two rivers dates back as far as the Jurassic and Cretaceous periods. Most of the 16 lakes within the park are rimmed with curvilinear boardwalks that wend alongside the most scenic waterfall areas, allowing visitors to get a closer look at the craggy travertine formations created by the constant rushing of water over mineral-rich rocks. Humans are not allowed to enter the clear, clean water here, and the buses and boats that transport visitors through the park use quiet, non-polluting electric energy. Surrounded by a pristine forest of beech, spruce and fir and carpets of lush ferns, the park is home to brown bears, wolves and rare eagle owls, as well as over a hundred endemic species of both birds and flowers. For fans of orchids, this is a floral mecca: botanists have so far identified 55 species within the park.